More and more people are using video as part of their online communication and content marketing and the number of people consuming video content continues to increase. With the introduction of 4G and the continued rise in the use of mobile phones and tablet devices for accessing the internet the consumption of video content is predicted to keep on growing. Video content is getting easier to create and people are becoming more relaxed in front of the camera. The April New Media Breakfast will explore different types of video content and look at some of the successful videos used in current marketing. We will also look at different options for producing video content and the type of equipment required for video capture. Capturing the content is only part of the process, we will also take a look at video syndication and how you promote your content and encourage people to watch it, and share it. Some people may wish to use video content but don’t have the resources or inclination to create their own content; we will explore the options available when outsourcing video production and highlight some of the things to consider when planning a video project. 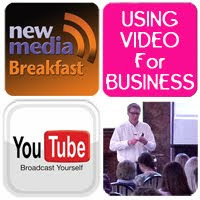 Gordon White, Managing director of fatBuzz Ltd will present the April New Media Breakfast.